The Request Services tab is used by core customers to initiate service project requests or individual services. As a core administrator, you can manage your projects and services that you offer to your customers. Note that this tab can be renamed in the Service Requests Settings‍, so it may not have the same name in your core. Service Requests panel‍: this panel can contain a customized introductory text to the service requests and a list of the available service request projects the core offers. This is also where the editing tools are located for the service projects. Services Panel‍: this panel contains all the individual services a core offers, a search box to easily find services and editing tools to modify the panel. Note that both the Service Requests panel and Services panels can be renamed in the Service Requests Settings‍. Service Requests allow a core to create an umbrella service offering to their customers. Cores can set up the project requests to collect all information needed to start the project. The core can set payment requirements, include forms that need to be completed, set milestones, define standard services that are part of the project, and determine estimated project costs. From a financial perspective, Service Requests serve as containers for the underlying charges, which are driven by specific services (as discussed below) as well as custom charges (ad-hoc amounts not tied to specific services). Core administrators and staff can initiate request on behalf of their customer, as discussed in Request Services‍. 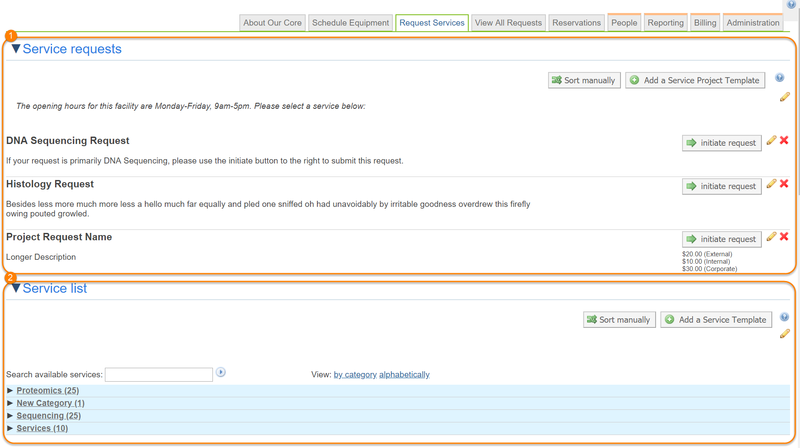 Core administrators can also customize the Service Requests panel‍ of their core. Services are the individual offerings of a core. Services can encompass anything from specific activities performed, to supplies that are sold or used in conjunction with a request. Services can be set up to require a form to be completed or to have a core staff automatically assigned to the service that will receive notifications. A core can allow customers to directly request individual services, or to have the services as view only. Services can also be included with the above service project requests. Each service can have a price tag associated with them, which can vary depending on the type of customer (e.g. internal to the institution, external academic, external corporate, etc.). Core administrators can customize the Services panel.